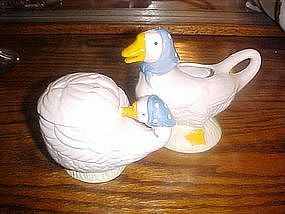 This is a darling set of geese creme pitcher and sugar bowl. Unfortunately the pitcher has a large hairline crack down the middle of the head. Still cute for display, and the sugar bowl is perfect. Sugar bowl has the cutout indentation for your sugar spoon. Creamer is 4 3/4" tall. Made of hand decorated glazed ceramic.